*	Requirements for the quality policy are defined in clause 5.3 of ISO 9001:2000. Because the quality policy is a document, it must be controlled according to the requirements of clause 4.2.3. Some companies that may be revising their quality policy for the first time, in order to meet ISO 9001:2000 requirements will need to pay particular attention to clause 4.2.3 (c), (d) and (g). *	Requirements for the quality objectives are defined in clause 5.4.1 of ISO 9001:2000. They are also subject to the document control requirements of clause 4.2.3. 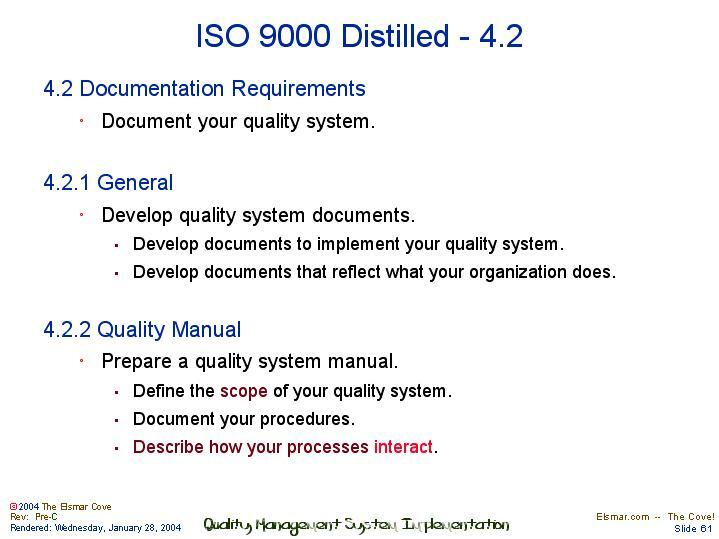 *	Clause 4.2.2 of ISO 9001:2000 specifies the minimum content for a quality manual. The format of the manual is a decision for each company, and will depend on the company’s size, culture and complexity. *	A small company may find it appropriate to include the description of its entire QMS within a single manual, including all the documented procedures required by the standard. *	Large, multi-national companies may need several manuals at the global, national or regional level, and a more complex hierarchy of documentation. *	Some companies (particularly larger companies, or those with more complex processes) may require additional documented procedures in order to implement an effective QMS. *	Other companies may require additional procedures, but the size and/or culture of the company could enable these to be effectively implemented without necessarily being documented. *	In order to demonstrate compliance with ISO 9001:2000, however, the company must be able to provide objective evidence that its QMS has been effectively implemented. *	Examples of quality records specifically required by ISO 9001:2000 are listed in the list ‘Records Required’ herein. *	Companies are free to develop other records that may be needed to demonstrate conformity of their processes, products and quality management system. *	Requirements for the control of records are different from those for other documents, and all quality records must be controlled according to clause 4.2.4.